The attempts to extend democracy from the political sphere to labour relations and the broader economy (Self-Government in Industry, as G.D.H. Cole wrote in 1917) keep resurfacing in various forms and under different names throughout the existence of both modern industry and agriculture. Producer cooperatives have been an alternative form of enterprise organization in capitalist economies at least since the 19th century. Very different schools of thought supporting workers’ “associationism” – socialist, anarchist, Christian – have seen worker-run enterprises as the basis of a more egalitarian society. Communist revolutionaries envisioned workers’ councils as the building block of post-capitalist political and social structures ever since soviets came to prominence in the 1905 and 1917 revolutions in Russia, but also a range of revolutionary stirrings in the aftermath of World War I (Germany and Austria 1918-19, Hungary 1919, Italy 1920, etc.). After the failed attempts of revolutionary change in Europe, the German, Austrian and Czechoslovakian states introduced new legislations enabling workers’ participation and representation on the enterprise level to various degrees. During the Cold War countries, such as Israel, Algeria, Peru and, most prominently, Yugoslavia, attempted to carve out a third way model of development by implementing workers’ self-management structures in their economies. Many postcolonial state building projects in Africa and beyond fused the idea of workplace democracy with local communal traditions. Workers’ self-management also served as an inspiration to dissidents in Eastern Europe (Hungary, Poland), while closely related terms such as autogestion and even operaismo became leitmotifs within the 1968 movement in Southern Europe as a vision of a more democratic socialism. Numerous welfare state models in the European countries, ascribed to the political “West”, developed partly far-reaching legal bases for workers’ participation, often relying on the concepts introduced by the legislative reforms immediately after World War I. In the 1980s, the self-management ideals of liberation in the most developed capitalist societies and in factories worldwide often metamorphosed into management tools within the framework of neoliberal politics. While many activists in (state-)socialist Eastern Europe envisioned workplace democracy as an opportunity to introduce economic democracy from below, notions of workplace autonomy were also used by the pro-market reformists inside the communist parties to decrease guaranteed workers’ rights. During the 1990s, when it seemed that the ideas of workers’ engagement in economic decision-making lost validity, a movement of factory occupations emerged in Argentina and other countries in Latin America, provoking a new wave of interest and debates about the perspectives of workplace democracy in the 21st century. As this short historical outline shows, initiatives for democratization of labour relations were carried by vastly disparate social actors under diverse types of labour regimes and political rule in many different parts of the globe. Not surprisingly, a substantial research literature on these phenomena has developed. Yet, studies of workers’ activation tend to have a narrow focus when it comes to the socio-economic complexity and the geographical scope of workplace democracy. Firstly, the topic has traditionally attracted left-leaning social scientists and heterodox economists inclined to look at the political organizing of the working class and economic performance of the enterprises respectively, thus overlooking labour relations and the inner workings of workplace democracy. Secondly, the studies were habitually framed in the context of individual nation states with the most illustrious historical projects claiming workers’ emancipation attracting the greatest attention. The attempts to produce overviews on the history of workers’ participation, control and self-management practices in different countries usually amounted to collections of individual case studies with moderate comparison, disregarding mutual influence, transnational exchange and transfers. 1.) To unpack and categorise the often interchanging terms and conceptualizations of workplace democracy such as self-management, control, participation, co-determination and autogestion (in different languages) by tracing their evolution globally and relating them to particular geographic locations, cultural contexts and historical conjunctures. 2.) 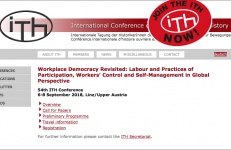 To examine workplace democracy beyond the political history of workers’ movements or business history of alternative management models by investigating the actual practices of workers’ involvement, decision-making and work conditions in concrete cases.